This brown butter farro is simple and tasty. It’s the perfect side dish for any meal, or can even be made as a light lunch. 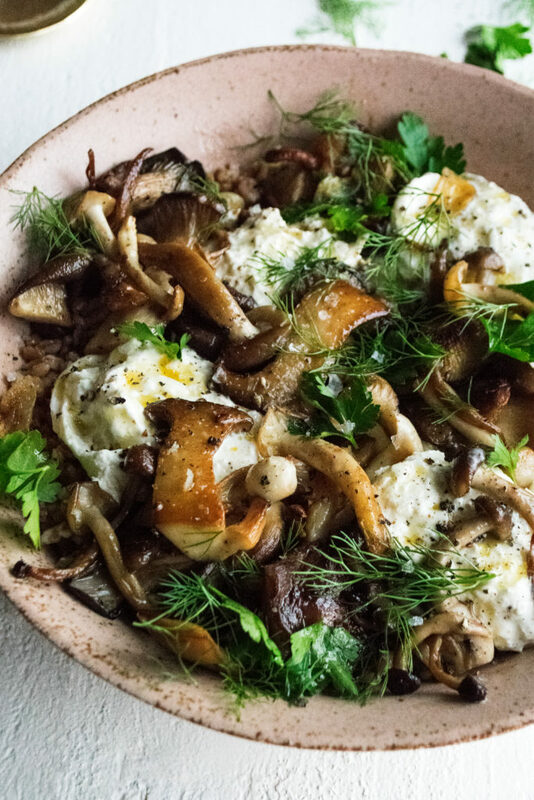 It’s full of caramelized wild mushrooms, lemon, herbs, freshly cracked black pepper, and of course some creamy burrata cheese! Recipes that I throw together on a whim are typically some of my favorites. They’re usually very minimal in ingredients because I’ll just be using whatever I have on hand. They rely on lots of seasoning – good salt, freshly cracked black pepper, citrus, and fresh herbs. 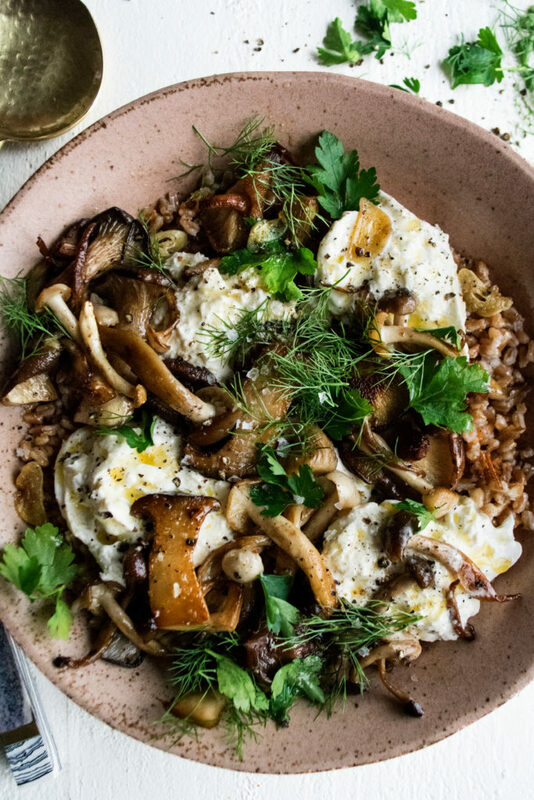 It’s my favorite type of cooking, and I’m so glad this brown butter farro resulted from it. I think this flank steak would be the perfect main dish to serve with this farro! Combine the farro, water, and a good pinch of salt in a saucepan. Bring to a boil. Reduce to a simmer and cook for about 30 minutes until tender. Drain any excess water if needed. Heat a large cast-iron skillet over medium heat. Add enough olive oil to coat the bottom. Once hot, add half of the mushrooms and a sprig of thyme. Let cook until brown and caramelized. Season with a pinch of salt and freshly cracked black pepper. Transfer the mushrooms to a plate. Repeat with the remaining mushrooms and thyme. Transfer all of the mushrooms and thyme back to the skillet. Add the butter and let melt. Add the garlic and allow to fry in the butter as the butter browns over medium-low heat, about 5 minutes. Stir the farro into the mushroom mixture. Allow to heat through for a minute or so. Lastly, stir in the lemon juice and parsley. 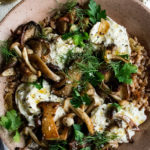 Taste the farro and season with more salt if needed. 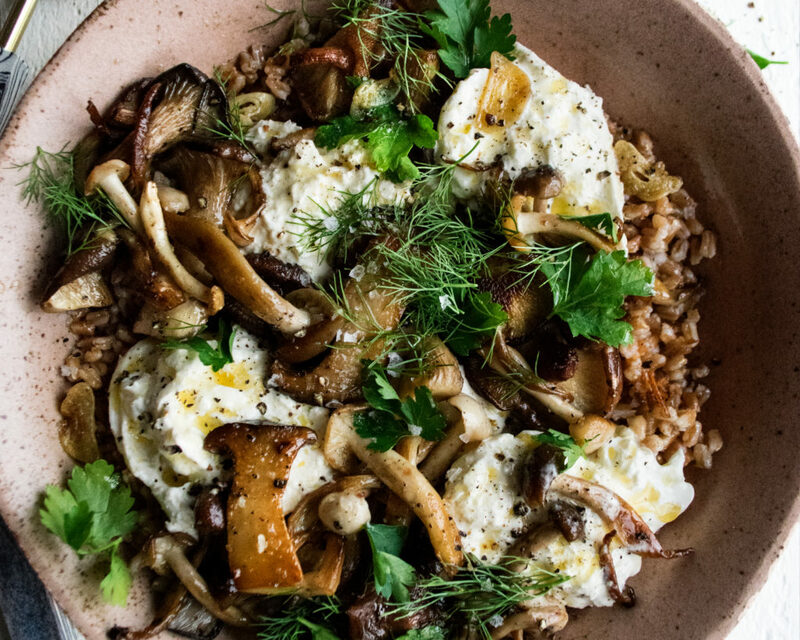 Serve the farro in a large bowl. Break the burrata cheese right over top. Season the cheese with salt, freshly cracked black pepper, and a drizzle of olive oil. Garnish with the parsley and dill leaves.